Really? A month already? Is it a rule that time has to move faster with each kid? Because I don't appreciate it. 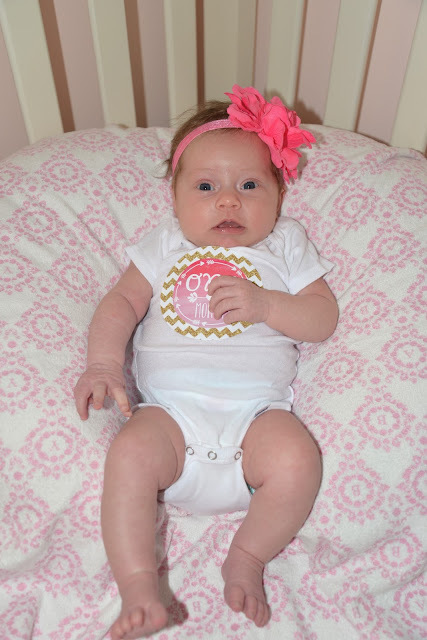 We had her one month appointment earlier this week and she was a hefty 10 lbs, 10 oz (82%) and 21.9 inches long (78%)! She did great with her heel prick and shot, got pissed for exactly 10 seconds then fell right to sleep. Because she likes to fall asleep in about .0005 seconds. She is my delicious little baby. I can't get enough of her cheeks and she is probably annoyed at this point at how much I kiss them. She is sleeping pretty well I think. We have her in the Rock N Play and she will usually give us one good 4 hour stretch and then 3 hour stretches for the rest of the night. She fell asleep flat on her back sprawled out like an eagle last night in our bed so we are thinking we might try the bassinet to see if she likes the space. Harper was the same way and earned a spot in her crib super early on thanks to her knocking on the (wood) bassinet early every morning! Hopefully she does well with the transition, otherwise its back to the Rock N Play! She eats like a champ. Thankfully she has started spacing out her feeding to 2-3 hours. She used to eat every hour when she was brand new. She does spit up a ton. But at least its a reason to demand time for a shower every day. Ok, every other day. She is overall a pretty easy baby when she's not gassy or tired. She is getting so much more alert and vocal and has actually started smiling at us in the last couple of days. And Lord knows that makes it all worth it. It's like they know they are about to break you down and then they smile at you. And all is right with the world again! Happy one month baby doll!